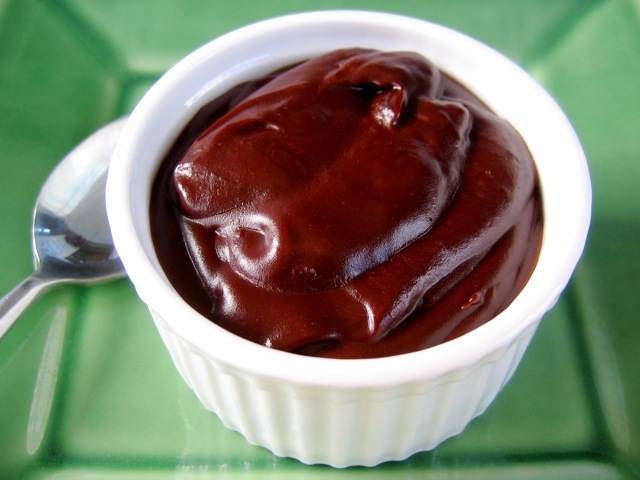 This recipe is a bit more involved than Moosewood's low-fat Dark Chocolate Pudding, but it's still fast and easy. And the greater richness of the ingredients makes the extra effort worthwhile; the results are intensely chocolatey. When the pudding has come to a low boil and begun to thicken, remove from the heat. Whisk in the vanilla extract and pour the pudding into dessert dishes or a single large bowl. You can let the pudding cool slowly on the countertop and serve it soft and warm, if you like. If you prefer to serve it firm and chilled, cover the pudding with plastic wrap (stretched taut if you like skin on your pudding, or pressed gently into the surface of the pudding if you don't) and refrigerate until set, about 30 minutes to an hour. Serve garnished with freshly whipped cream and grated semisweet chocolate, if you like. You can replace the 3 cups of liquid dairy with any combination you like: all whole milk, all half-and-half, etc. Don't use all skim milk, however; the pudding deserves the richness and thick mouthfeel of milk fat. Feel free to add a splash of liquor, such as Grand Marnier or brandy, to the finished pudding along with the vanilla extract.